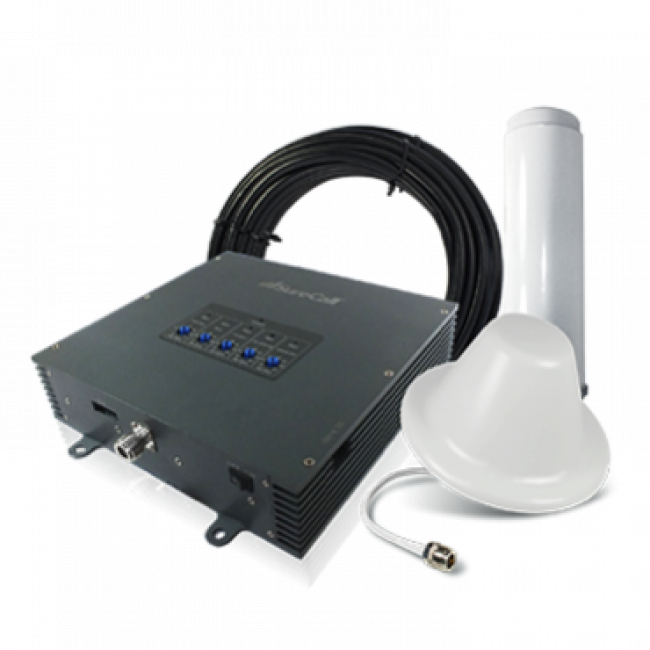 The SureCall Fusion-5 Signal Booster Kit has been discontinued and replaced by the new and improved SureCall Fusion5X Signal Booster Kit. 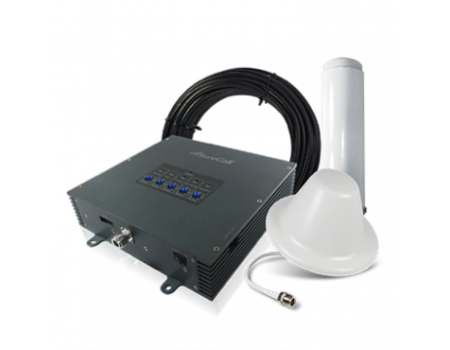 The SureCall Fusion-5 Signal Booster Kit by Cellphone-Mate is a wireless signal booster that can amplify the 2G and 3G and 4G LTE networks from virtually all carriers in the US and North America. The SureCall Fusion-5 repeater features a powerful 72 dB gain which gives it a total coverage area of up to 6,000 sq ft (depending on existing outside signal strength) making this the ideal amplifier for homes and small to medium offices. Because this is a powerful amplifier, you must have a minimum of 20 ft of vertical separation between the inside and outside antennas. Adding up to 75 feet of horizontal separation can help improve the performance of this signal booster by minimizing the potential for oscillation (feedback) between the inside and outside antennas. The SureCall Fusion-5 72 dB Signal Booster for Voice, 3G & 4G LTE is configurable and can include different inside and outside antennas depending on your needs. All configurations start with the same Fusion-5 72 dB 5-Band Consumer Cellular Amplifier/Repeater and include a 75 ft. LMR400 Ultra Low Loss Coax Cable that is used to connect the outside antenna to the amplifier and a 30 ft. LMR400 Ultra Low Loss Coax Cable that is used to connect the amplifier to the inside antenna. The inside and outside antennas can be customized to fit your needs. Yagi Antenna - Best for moderate to weak existing outside signal. The Omni Antenna included in the kit is a SureCall Full Band Fiberglass Omnidirectional Antenna (CM288W) with a 4 dB gain. Because it's omnidirectional, it will work for all carriers in every direction that have an existing signal. Omni antennas are not as powerful as directional antennas, so you'll generally get less coverage with an omni antenna and we only recommend them for situations where you have a moderate to strong (3-bars or more) existing outside signal. The Yagi Antenna included in the kit is a SureCall CM230W Yagi Outside Antenna with a 10 dB gain. Directional antennas must be aimed and can cover about 15% of the horizon in one direction. Aiming the directional antenna is fairly easy through trial-and-error, just contact us for details. Because a directional antenna must be aimed, you may only be able to cover one (or a small subset) of carrier(s) with towers in that general direction. The advantage is that because they are aimed, they're much more powerful so you'll get more coverage area with a directional antenna. We recommend directional antennas for all situations where you get a 2 bar or weaker outside signal. Multiple directional antennas can be used if multiple carriers are required, contact us for details. The Dome Antenna included in the kit is a SureCall CM222W omni antenna with a 5 dB gain. It can only be mounted to a ceiling and you must have access to the backside of the ceiling, so it's best for drop ceilings or locations where there is an attic above the ceiling. 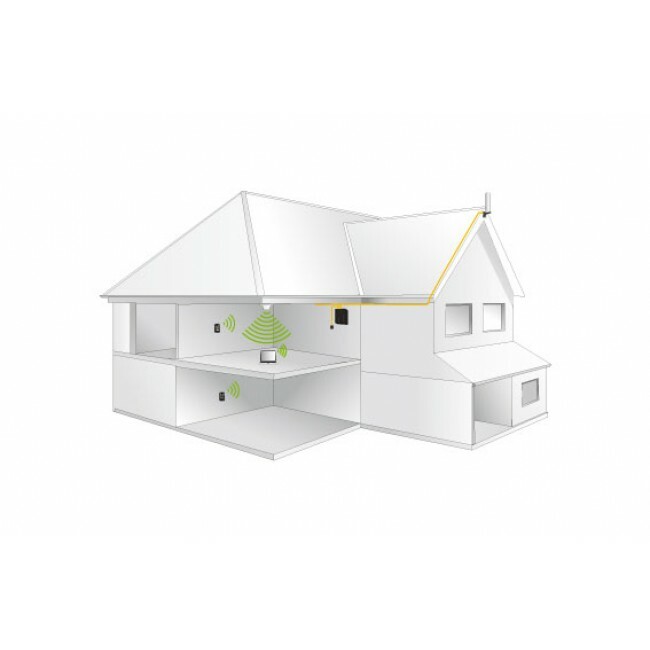 Dome antennas work best for single floors but can cover multiple floors depending on the floor construction. The Panel Antenna included in the kit is a SureCall CM248W directional antenna with a 10 dB gain. It can be mounted to a wall, ceiling, or virtually any other surface. The signal comes out of the front of the panel antenna so they must be aimed in the direction where you want the boosted signal. If you have any questions about which options will work best for you, just give us a call at (800) 590-3564.